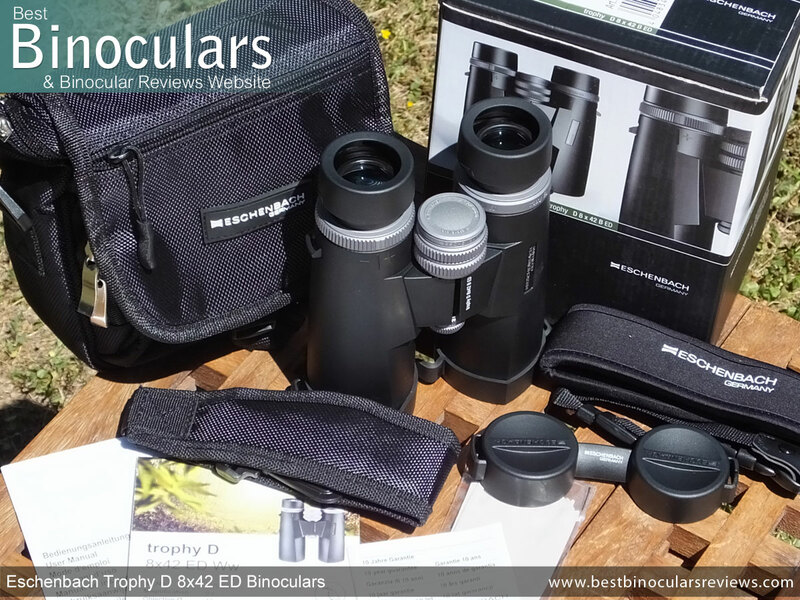 The Trophy series of binoculars from German brand Eschenbach is quite large and consists of a wide variety of higher end products. Most are roof prism binoculars, but it also includes a number of porro prism models and a spotting scope. 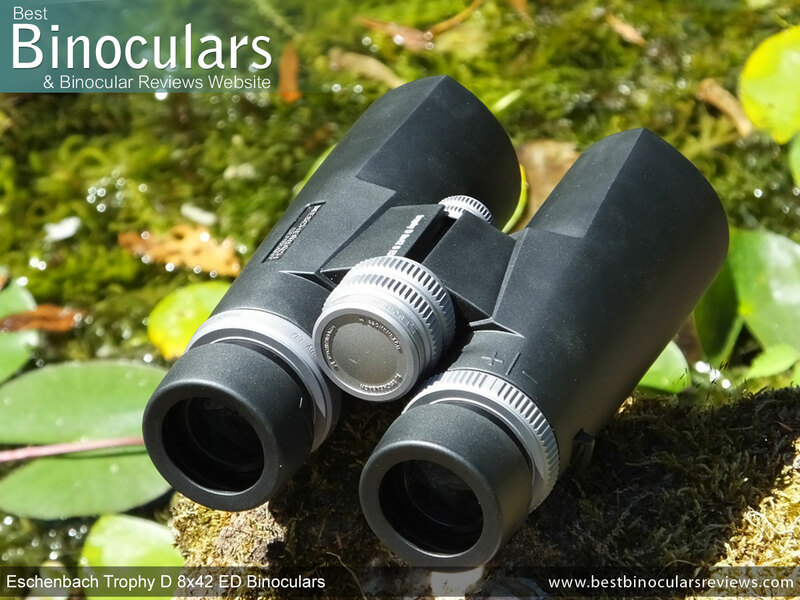 With the aim of delivering an even higher image resolution, all the roof prism Eschenbach Trophy binoculars have recently been updated and now they also feature ED glass lenses. 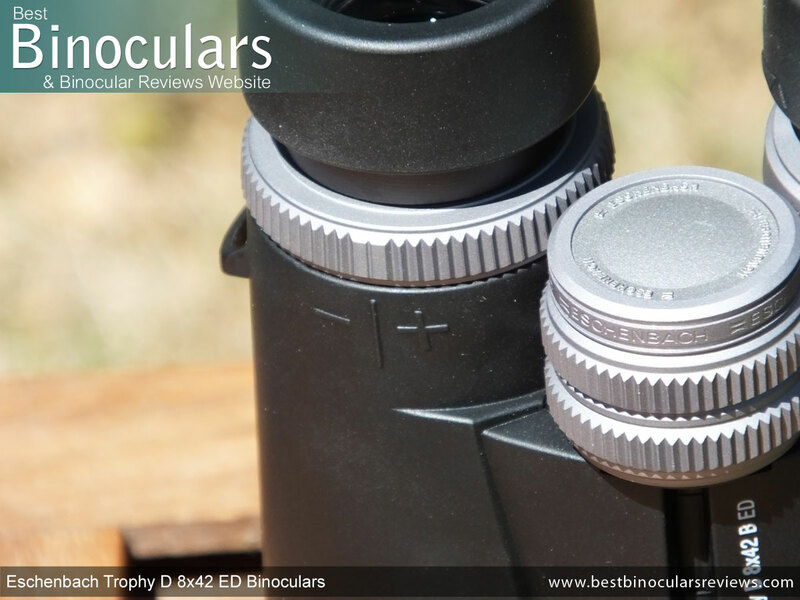 Firstly the single bridge is thinner than the standard design and then it is positioned closer to the eyepieces than the objectives. This "top hinge" arrangement frees up more space on the lower parts of the barrels, which in turn offers you a large are with which to securely grab onto them. Whilst I will concede that this is not really that important whilst you are looking through the instrument, either of the exposed barrels does provide you with far better and secure grip if you decide to carry the bins in one hand when not using the neck strap, something that I do quite regularly. Another very minor departure from the norm are that the ends of barrels (from the bridge to the objectives) are not perfectly circular, instead the way the rubber coating is moulded gives them an eye shape, which not only adds a little to their aesthetics, but also adds to the grip by giving you a nice ridge to hold onto. These Eschenbach Trophy ED binoculars have housings made from Magnalium, which is an alloy made mostly from Aluminium and Magnesium as well as minor amounts of nickel and tin. 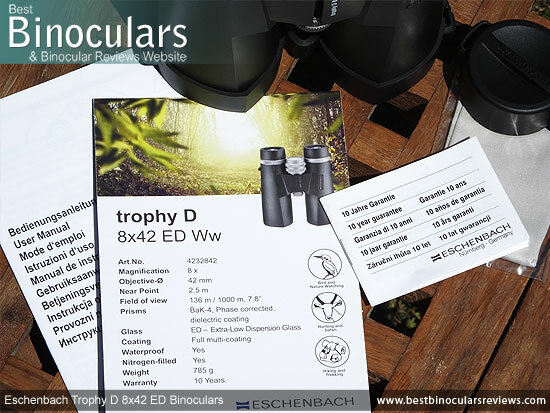 Eschenbach Optik don't reveal the proportions of each, but basically the Magnesium makes the Aluminium easier to work with and lighter as it is less dense and thus is usually an improvement than pure Aluminium housings. It is no surprise to discover (indeed it is expected) on any higher end bino that the shell has been fully sealed, making them watertight. Although Eschenbach Optik do not go on to quantify this with a depth or official standard, so whilst I would never advise that you deliberately submerge them to test, I am sure that they will be more than fine in the wettest of outdoor conditions. Just keep in mind that having being sealed, the insides are also protected from dust entering that can spoil the view on an optical instrument. Eschenbach have opted to use a really hard and quite thin rubber coating on the exterior of the Trophy D.
These two properties will mean that it provides less cushioning than a thicker more softer rubber. But on the flip side of the coin, it fits a lot better to the chassis than those with thick soft rubber coatings and in my experience is longer lasting as this type of rubber seems to not perish as easily. Eschenbach have also chosen not to texture the surface of the rubber, rather keeping it smooth. This looks great, but the negative aspects to this are that you get reduced grip and the harder, smooth surface is far more reflective, which does make them less camouflaged than they could be. 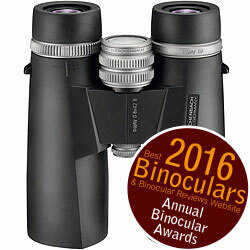 To me it looks like the eye-piece housing on theses Eschenbach Trophy D binoculars are fashioned from metal which is good. Some will use plastic to save costs and it does make for a more lightweight instrument. 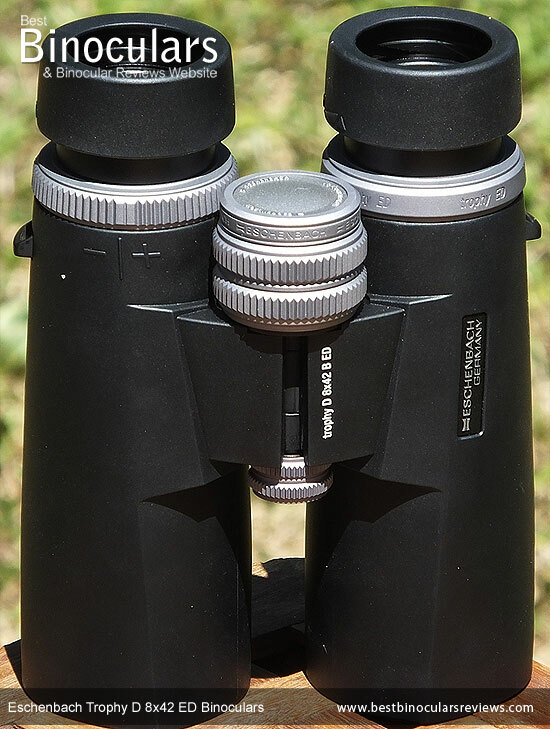 But as this is an area on the bin that most often gets damaged when dropped, I feel that the integrity of these parts cannot be overstated and so it is most certainly something I look for when choosing a higher end binocular like these. The cups are nice and large (4.1cm diameter) and whilst they are padded, like the body, this coating is really thin. Generally speaking, these are not the most comfortable eye-cups ever, but to be fair, I was never aware of any more discomfort than normal whilst using them. 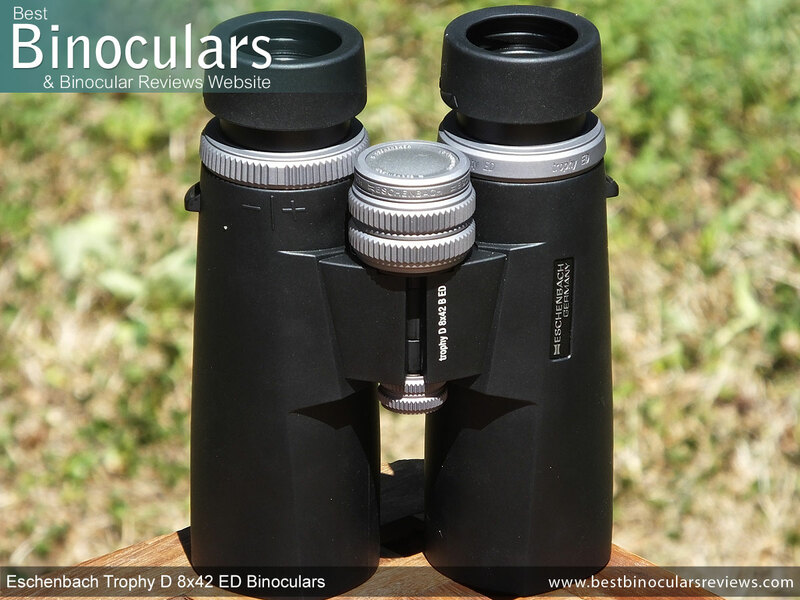 Personally I love the look and feel of the mostly metal focus wheel on these 8x42 Eschenbach Trophy ED binoculars. My test sample turned very smoothly and there was no sticking points or free play anywhere along the focus plane. Speaking of which, it takes about 1¾ turns (630°) of the focus wheel to go from one end to the other. In my experience this is about average and thus is a nice compromise between the speed of making large focus adjustments and being able to easily and accurately make small changes. At 30mm in diameter, it is not the largest focus wheel found on a full sized bin, but the deep and quite jagged metal ridges that run along it's circumference are excellent as they provide you with a nice tactile feedback as well as tons of grip. For most of the time this is perhaps more than required, but should you be wearing very padded gloves in winter, then this can make a difference. 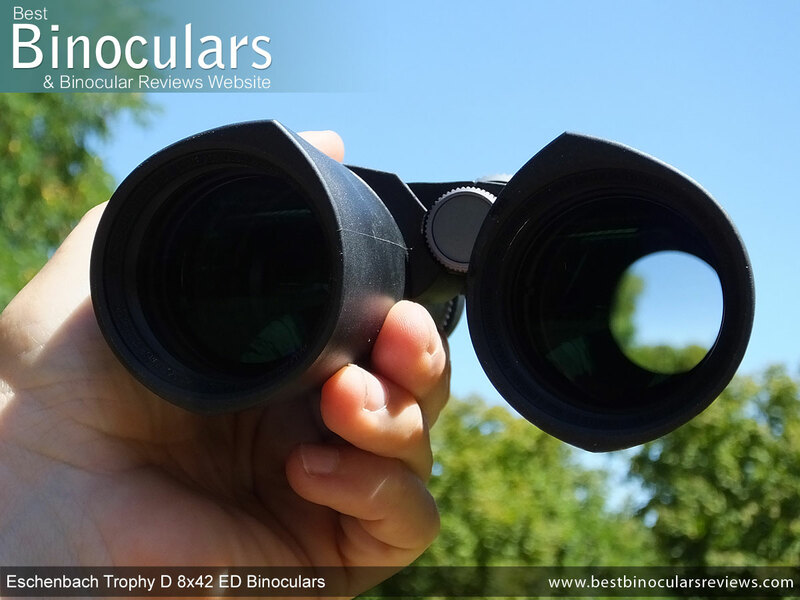 Like the focus wheel, the diopter ring is metallic which is a nice touch and like the focus wheel it has jagged ridges that make for the perfect non slip surface when setting up your binoculars for your vision. Whilst the ring is situated in the normal position near the right eye-piece, what is different from the norm is that they have decided to place the markings on top of, instead of under the binocular. However apart from how it looks, this makes no difference to it's actual function. As far as it works, all is good. It is tight, which prevents it being moved by accident, which is good as unlike the best ones, this does not have a locking mechanism which for a bin at this level is a little bit of shame, but by no means a deal breaker. Eschenbach publish the weight of these 8x42 Trophy ED binoculars as being 785g (27.7oz), which as you can see from the comparison table below ranks them angst the heavier 42mm bins. Whilst being lightweight can be important, don't disregard the importance of the fact that that these not only have a metal alloy chassis, but parts like the focus wheel and eye-cup housing are metal as well, whereas plastic parts will be used on many lower quality products. Also whilst this is the published figure, I checked on my digital scale and got 732g (with neck strap and lens covers removed), so once again Eschenbach are doing themselves no favours here. As you can see from the advertised dimensions above, this Eschenbach Trophy is in terms of size fairly standard for a 42mm binocular. I don't have any info on their make up, but I can say that the external ocular lenses on the eye-pieces of these Eschenbach Trophy 8x42 ED binoculars have a 23mm diameter, which is nice and large. The objective lenses are as the name suggests 42mm diameter and are set back about 16mm in from the ends of the barrels. This is incredibly deep and as such, this offers them plenty of protection from physical damage and helps prevent dust, or light rain from reaching the glass surface. Remember the less often you have to clean your lenses, the better. As is indicated in their name, these Eschenbach Trophy D 8x42 B ED binoculars have ED glass lenses. What this means is that whilst most bins will have lens elements with low dispersion properties in order to potentially better direct the individual light wavelengths, these have extra-low dispersion elements and so have the potential to offer even better image quality as used correctly can decrease chromatic aberrations even more and thus show even less signs of color fringing. Take a look at the Image Quality section down below, to see how they actually performed in this area. Apart from their body shape, their name gives you a clue as to the design of prisms used within - the D in the Eschenbach Trophy D 8x42 ED binoculars name indicates that they use the Dach prism design, which is German for roof and thus indicates that they have used roof prisms (you can click on the link to discover the relative strengths and weaknesses of this design). Important here to note that Eschenbach Optik state that high quality BaK-4 glass is used to make the prisms, which is exactly what we want to see here. Unsurprisingly in this high end range, but important to note is the fact that the optics on the Eschenbach Trophy ED's are Fully Multi-Coated. This level of anti-reflection coatings on all exterior glass sections throughout the optical path makes a huge difference to the brightness and overall standard of image delivered to your eyes. For more details take a look at this section on Anti-Reflection Lens Coatings. Whilst the roof prism has many advantages over porro prisms, there are also some issues that need to be rectified in order to get the best out of them, which not all manufacturers do. One of which is to correct a the problem of the individual wavelengths of light going out of phase with each other, which leads to a lower resolution image. So it is good to see that Eschenbach have coated the prisms with a special material that corrects this and which is why they are now described as being phase corrected. Another issue with this prism design is that one prism surface does not reflect all the light that hits it. To improve this, highly reflective material is added to this surface to ensure the brightest and highest quality image results. As you would expect, there are different levels of material that is used. 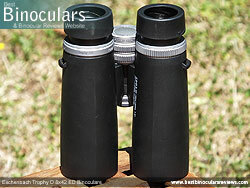 On cheaper optics, you often find Aluminium mirror coatings and then many higher end optics use silver mirror coatings. 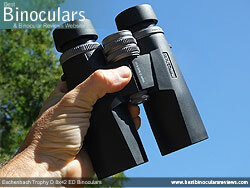 The at the very top end, you get bins like these Eschenbach binoculars that have dielectrically mirror coatings. Whilst this process costs a lot more, the result is the highest level of reflectivity (approx 5% more light is transmitted than those with sliver coatings) which most certainly adds to the brightness and all round image quality. Publicized as being 136 meters wide at a distance of 1000 meters away (408ft at 1,000 yards), you can see from the table below this is a nice wide field of view for an 8x42 binocular and equates to an angle of view that is 7.75 ° and thus they qualify to be listed on my page of wide angle binoculars. 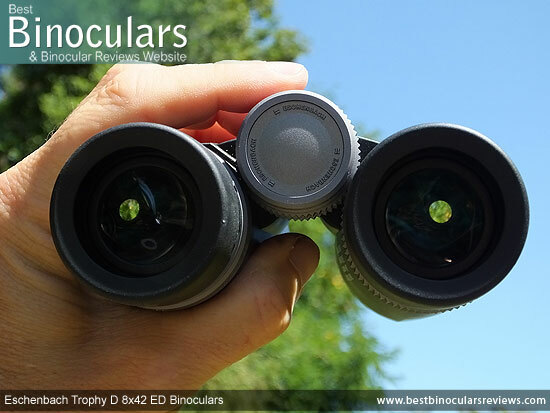 Having a wide view is advantageous in many situations, but is especially important for activities like bird watching, on safari or hunting when you are either trying to quickly locate a small and/or fast moving critter from closer ranges or indeed when searching for something way of in the distance, and so here could also be useful for search and rescue and even plane spotting etc. Whilst their FOV is excellent, unfortunately their 'advertised' eye-relief is not. 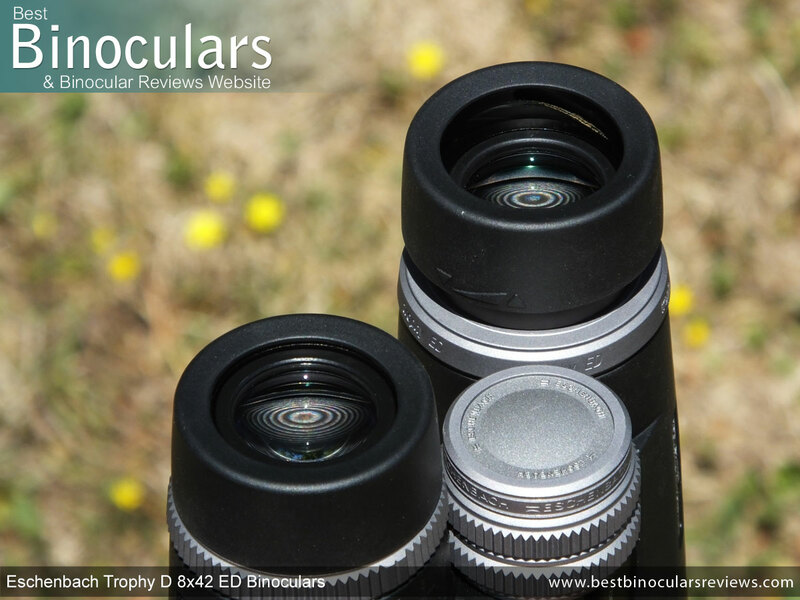 Eschenbach state that the 8x42 Trophy D has a "Pupil focal distance" of 4/11 min./max. I was a little unsure of this as it is not usually expressed in this way, but it was confirmed to me that this indeed was their eye-relief measurements. With a stated maximum of only 11mm, this seems quite short and whilst for the most part it does not affect those who don't wear glasses, it would potentially make them unsuitable for anyone who does need or want to wear glasses whilst binning. However I do suspect that this measurement is incorrect as just by comparing how far the eye-cups twist up to their maximum height with other bins, these do not look to have an especially short amount of eye-relief. To test this, I twisted down the cups, put on my sunglasses and indeed found that I had no issues being able to get the full view with the glasses on. So whilst I can't give the exact figure, I can say that it is more than 11cm and feel that it is probably nearer 17cm or more. In their specifications, Eschenbach list the "Near point" as being 2.5m (8.2ft), which I take to mean their official minimum close focus rating. As you can see from the comparison table above, this is ok, but far from great. Once again however, I do feel that they are doing themselves an injustice as I was able to focus on objects at a measure distance of only 1.46m (4.8ft) which is excellent for a standard sized bin with an 8x magnification and ideal for those who sometime find themselves wanting to view objects like flowers or insects from closer distances. Note: The Optical Stats Score (below right) is based on their official figures which I have had to use, but do believe that it is actually better than this. So do all the top end components and coatings like ED glass, fully multi-coated optics and phase corrected, dielectrically coated BaK-4 prisms instantly produce a superior image? Not always as they all still need to be very skillfully combined into a harmonious optical pathway. 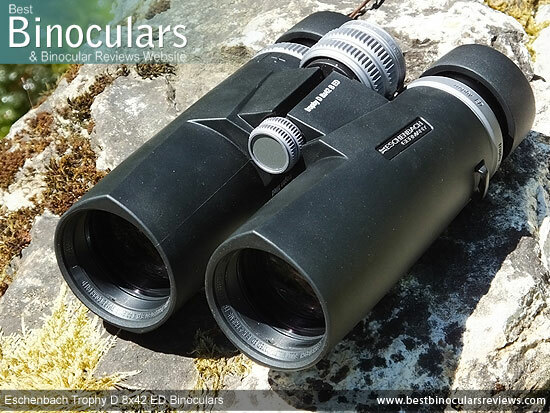 Like many high end binos, these Eschenbach Trophy D 8x42 ED binoculars have a number of features like being fully-multi coated and using dielectric coatings on the prisms, that are designed to transmit as much light as possible and as such you would expect them to deliver a really bright image. Well I was not to be disappointed. In normal daylight conditions, they look nice and bright, but to be honest when there is more than enough available light it is hard to tell the difference between two similar configured instruments (8x42 in this case), unless one is particularly bad. So against my mid range and very high end 8x42 benchmark bins these all looked very similar in these conditions. It was only in poor light at sunset when I could notice that these were better in these conditions than my standard mid range 8x42 benchmark, and to my eyes just as good as my alpha 8x42 bin, which is impressive. Here again it is only if an instrument is particularly bad that the difference is instantly noticeable. These Eschenbach's are not bad in this area, in fact I would say that they are very good: The colors look vivid, but natural and I thought the contrast was the same. Using extra low dispersion (ED) glass to reduce chromatic aberrations that cause color fringing, you would expect the Trophy ED to excel in this area and indeed it does. By looking very carefully along the edges of dark objects like telephone lines and tree branches against a bright sky I could see a degree of color fringing, but it was less than my mid range benchmark and equal to that of my alpha level bin - once again this is excellent. As well as color fringing, you can very occasionally come across other distortions where the image looks to warp either inwards or outwards. I was never aware of this when using these Eschenbach Trophy binoculars. The amount of image softening or blurring right at the edge of the view on these is also extremely minimal and in my experience equal to the best in this area. These Eschenbach binoculars must come with one of the most secure protective cases out there: For many manufacturers, the flip over lid held closed with a quick release clip would suffice, but Eschenbach have also decided to add a second Zip closure. Thus there is no denying that once you have your bins Zipped and clicked inside, they nor the lens covers will most certainly never accidentally fall out. But on the negative side you could say that the time to access your optics is increased and when "that bird" is just about to take flight, this small detail can be critical. To be fair to Eschenbach you can leave the Zip part open and only use the quick release clip when out in the field and then when storing your bins, close both. Brilliant or just a little overkill - it just depends how you look at it and I will leave it up to you to decide. For example like many cases, this one has a belt loop on the back face and so should you wish to carry your bins on your hip this is made possible. However unlike many that simply have a loop sewn onto the back of the case, this one can be quickly clipped open and so you can attach it without having to completely remove your belt and then thread it through the loop. What is more this closure is made even more secure with a strip of Velcro underneath the clip - excellent. The bag also has it's own carry strap. Not only is this strap padded and curved for a better and more comfortable fit, but it attaches to the bag via a couple of quick release swivel clips, which can obviously quickly and easily be removed should you wish to carry the bag on your hip - believe it or not this oversight is something that many other manufacturers miss! Another really aspect of this bag is that it comes with not one, but two separate pockets. One is located on the top of the flip over lid and the other larger pocket on the front face of the bag. Both can be Zipped closed and are thus perfect for securely storing things like your cleaning cloth as well as personal items like car keys and your wallet. Another important aspect to this bag is that the bins fit snugly inside, but without being too tight. By this I mean that you can still close the lid with the eye-cups extended and covers on. The padded section is substantial, made from what looks like neoprene, the underside has been left exposed to provide extra grip that helps stop it from sliding around your neck which is something that can be really annoying on less well designed straps. I also really like the fact that the thinner sections have quick release clips on them, meaning that you can quickly remove the main part of the neck strap from the binocular without having to unthread it. However I do feel that Eschenbach have missed a trick here as both the clips are in the same order - by that I mean that the male part of the clips are on the padded part of the strap and the female part on the thin strap. If however they had alternated the Male/Female parts on each side, you would then be able to connect the short straps left on on the binocular after the padded section had been removed and thus been able to create a short hand strap. This is an excellent feature that I really like, but only seen on a few bins, for example take a look at the Opticron DBA VHD 10x42 Binoculars. Fabricated from a soft rubber/plastic, both the eye-piece covers and the objective lens covers fit well and thus don't fall away to easily, which is something that is not only annoying, but can lead to you loosing them and the possibility of having your lenses getting dirty or even worse - scratched. The design of the eye-piece cover or rain-guard as it is sometimes referred to is fairly typical in that the two cups are joint together via a flexible bridge. 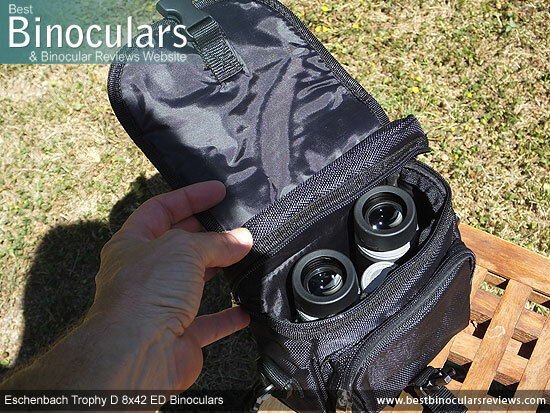 The importance of this is that it permits you to fit it back onto the binocular and keep your desired IPD setting. There are also a couple of loops that enable you to thread them through the neck strap and thus keep them close at hand at all times. The objective lens covers are very similar in their basic design as the rain-guard, just a little larger. To be honest, I prefer the ones that are tethered to the ends of the barrels and simply hang down under the bin when you have them opened. But that is just my personal preference and I am sure that there will be many who have the opposite mind-set. 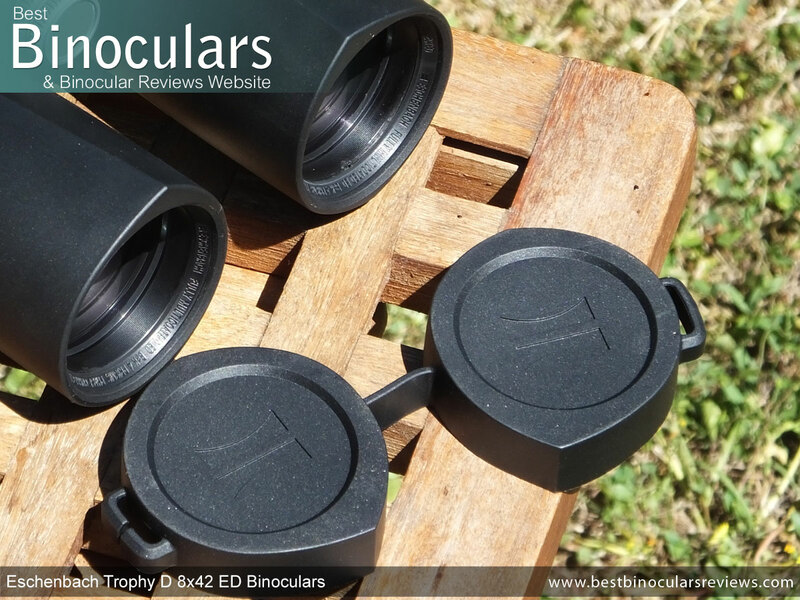 Another tiny detail that I noticed is that whilst the eye-shape design of the barrels on these Eschenbach Trophy D binoculars look great, because they are not circular, it has meant that the lens covers have also had to be designed to match this shape. This in turn means that you have to be more accurate when putting them back onto the bin and whilst not at all difficult, there is no doubt that it is a fraction easier and thus often quicker to put back circular shaped ones. 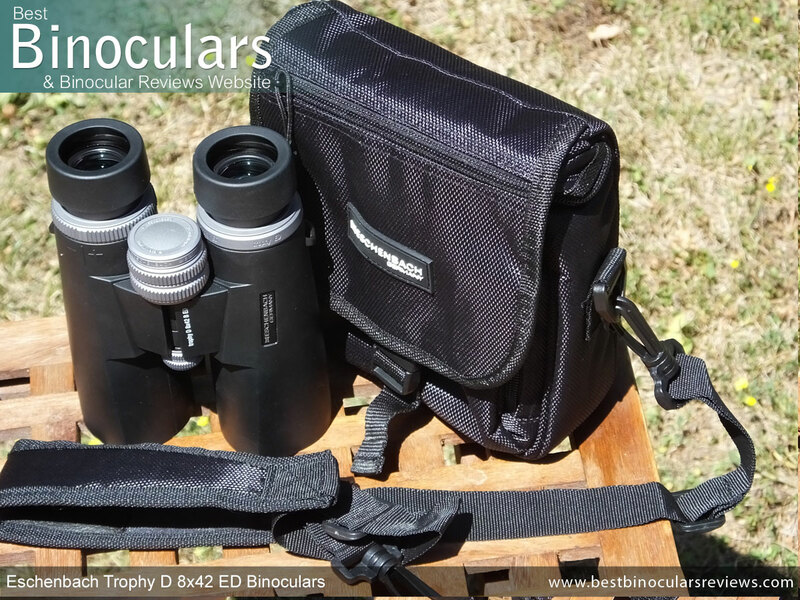 These Eschenbach Trophy binoculars do come with a reasonably good quality cleaning cloth that is perfect for cleaning the body and perhaps light use on the lenses when out in the field. As always, I still suggest that you invest in a decent lens cleaning kit to properly clean the glass and maintain the integrity of it's sometimes delicate coatings. This Eschenbach Trophy D binocular comes bundled with what at first looks like a fairly comprehensive set of instructions, but on closer inspection, you will find that like most others, the booklet covers a wide selection of languages and so in reality you only a get the most basic information which is a shame. Eschenbach Optik do include a statistics card, but once again this only reinforces what has already been printed on the box. Making up for the basic manual, is the very comprehensive 10 year guarantee which goes to show that Eschenbach have a lot of faith in their product. Details of the guarantee are included in a separate booklet. Strong Points: There is no denying that for the most part, the build quality and the materials that are used on the Eschenbach Trophy D 8x42 ED Binoculars are excellent and this goes equally for the accessories as well. Examples of this include almost the entire exterior and the chassis: I love the metallic eyepiece housing, diopter adjustment ring and focus wheel (although I wish they had used a metal face plate on it as well and whilst these as well as features like the Magnalium chassis increase the weight, the feeling of quality cannot be mistaken. 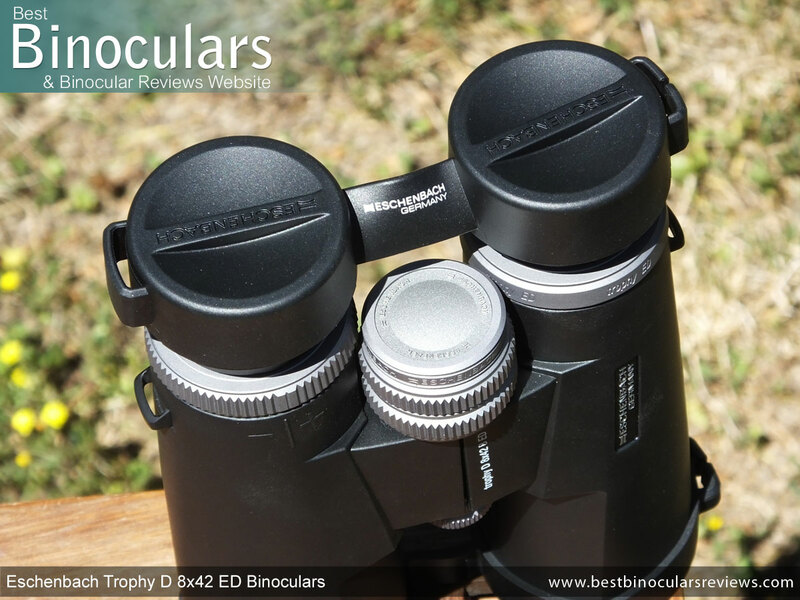 Not only is the image very bright, with great color reproduction and what I thought was a very high definition, but these 8x42 Eschenbach binoculars also have an excellent wide field of view that remains sharp right to the edges. This is an advantage in many situations, but most importantly for many types of wildlife observation like bird watching or hunting where you are either trying to follow or search for something. The same could be said for search and rescue and indeed many other applications. Weak points? The stated or official figures for the minimum focus distance and especially the amount of eye-relief are both not great. However as I have already discussed, I believe that both these figures (especially the eye-relief) to be incorrect and they are actual far better in reality. 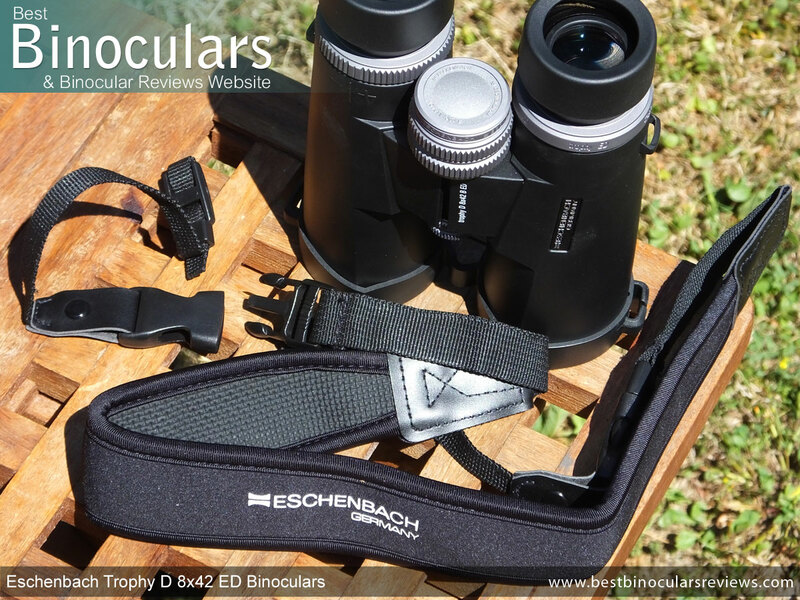 Still it is a shame that in taking so much time to produce such an excellent binocular, Eschenbach have not carried this quality control through with the reporting of the specifications, which is misleading and doing themselves no favours at all. Broadly speaking binoculars (and other optics) made in Germany (and the other traditional "optical" areas of Europe) have a well founded reputation of being of the highest quality, but are also perhaps not known for not being the value for money purchase you will ever make. 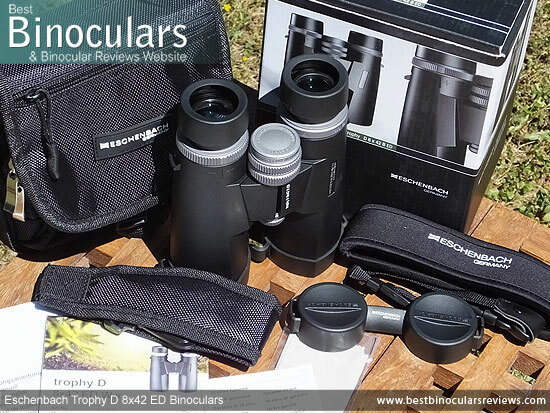 I think however with these Eschenbach Trophy D ED Binoculars, you in many ways getting a good dose quality AND good value. 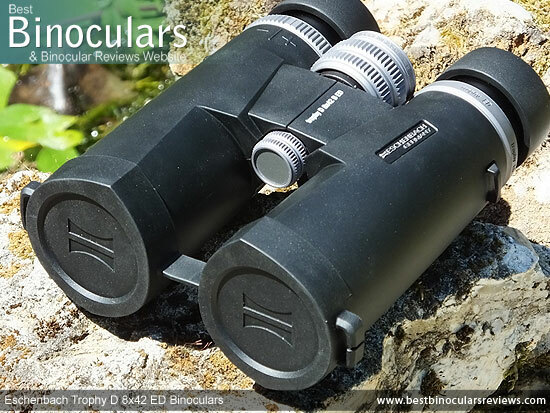 Sure these Eschenbach's have a little way to go to match the uber expensive "big three" in a few departments, but make no mistake, they are still a very high quality pair of binoculars made in Germany at a price that is on a par with many Japanese or American instruments that use a similar level of materials and coatings.